Thanks for taking the time to find out more about our products and services. Here we hope you find answers to the most frequent questions related to party rental service on the Gulf Coast. While this is just a partial list, we know this won't cover every contingency, so if you don't see the information you need, please call us at (228) 243-7493 and we will be happy to assist you. A: Yes, Please call our office for a current quote for cities outside our radius. A. We are available 7 days a week (8am-7pm). You may email 24/7. We do have emergency customer service incase you have an issue with your unit. We are always here for our customers. Q. What times should I choose on the reservation? A. Only choose your party times even though it is a one day rental. Call if any questions. Q: Is overnight delivery or pickup available? A: Sometimes. Please place a note in your reservation if you would like an overnight delivery or pickup. We cannot guarantee this but we will try to accomodate most requests. Note: You will be liable for all damages that occur. Example: A dog tears up the extention cord then there is a $75 fee. A:*All Saturday parties will be delivered on Friday afternoon and picked up Sunday morning unless otherwise specified. *All Sunday parties will be delivered the morning of and picked up the following day. *Ask about our weekend specials that we offer. Q: We have rented some really dirty jumps from other companies in the past. Are they always that dirty? A: No. The jump should be clean when you get it. Biloxi Bounce House Inc. cleans and disinfects after every rental. If you see an issue, please call us and ask for the owner immediately. A: Yes and No. A blower keeps air in the jump unit the entire time. Once unplugged they deflate. That is why we require an outlet within 50 feet of the unit or a generator. Longer cords can pop your circuit breaker so we bring our own heavy duty cords. Please do not attempt to use your extentsion cords. Do NOT leave the unit running and with children in it during inclement weathers like winds above 20mph, rain/storms(death could occur from electric shock from blower).etc. You are responsible for all damages due to neglience due to leaving unit operating during inclement weather. A: We love setting up at parks but most parks do NOT have electricity. If you want to set up at a park, you must rent a generator or provide one. Also, parks are first come, first serve so get your spot early in the day. A: Cash or Credit Cards. A: Yes all orders require a $50 Credit Card deposit. The are fully refundable if you cancel your order at least 5 days prior to your rental date. Deposit is refundable if there is high chance of inclement weather. A. The size of the jump is listed on the page once you click on the picture. A: Check the requirements listed with each jump. Also, make sure you have at least a 4 feet of access to the area where it will be set up. The jumps can weigh up to 650 pounds so we need a clear path with ample room. A: We can set up on Grass (our favorite and best for the kids), dirt, asphalt, and concrete. Sorry, we can not set up on any type of rocks as the constant rubbing will wear through the vinyl jumps. 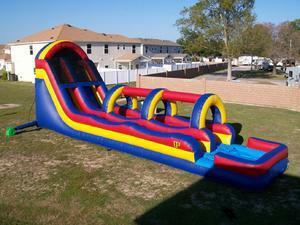 Dry Slides, Waterslides, and Obstacle Courses CAN only be setup on grass or sand. A: Yes and no. You are not responsible for normal wear and tear on our units. Seams may develop tears in high traffic areas over a period of time. If this happens please alert us at once so we can remedy the situation. If however, damage occurs due to failure to follow our safety rules or negligence (i.e. not turning off the blower in high winds, using Silly String,etc) you will be responsible for all damages up to and including replacement of the unit/blower etc which can cost thousands of dollars. We do not want you or us to be in that situation which is why we have you sign and initial on all of our safety rules so that you can be the trained operator.